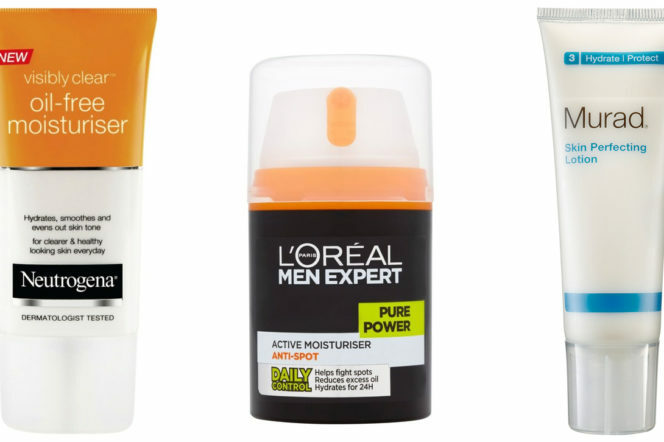 "In the same way a suit works best if it’s tailored to your body, face creams work best if they’re in perfect sync with your skin"
Applying a moisturiser each day is probably the single most important step a man can take to protect his looks. Containing humectants to draw water to the skin and emollients to seal in moisture, they not only ensure skin feels comfortable and functions properly, they also help minimise the risk of premature ageing because the drier the skin the more likely it is to wrinkle. Everything from pollution and air-conditioning to caffeine, alcohol and harsh soaps and cleansers can rob skin of the moisture it needs by look its best by interfering with its natural protective lipid barrier. As a result skin begins to feel tight and becomes dry and flaky – a problem which can worsen in your late 30s and 40s when production of sebum, the skin’s natural oil, begins to slow down. 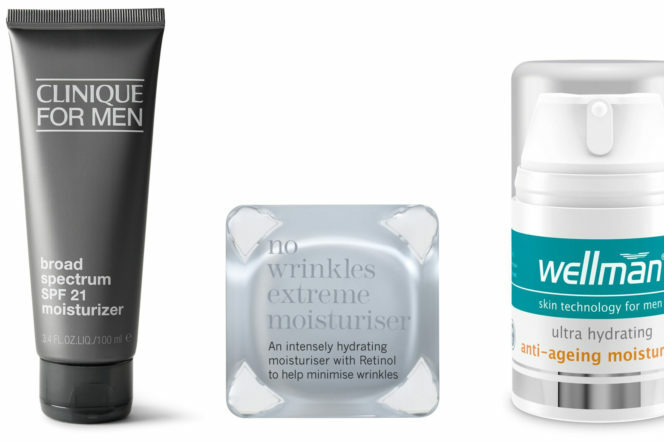 To keep dry skin hydrated use a moisturiser designed to provide continuous hydration, like Kiehl’s 24-hr Ultra Facial Cream or ones like Malin+Goetz Vitamin E Face Moisturiser which contain hyaluronic acid – an ingredient which can hold 1000 times its own weight in water and helps maintain optimum hydration. Apply in the morning and again at night, after cleansing. A lot of men assume – wrongly – that if their skin’s on the oily side it doesn’t need moisturising but since oil and water are different things even skin prone to the occasional oil slick can be dehydrated beneath the surface. The trick to moisturising if you’ve oily skin is to opt for a lightweight, oil-free product or one labelled ‘oil-control’ like Lab Series’ Oil Control Hydrator which is designed to hydrate skin, absorb excess oil and leave skin with a matt finish. After all, the only thing you want shining is the paintwork of your car. Greasy skin is the skin type most prone to spots and acne because excess sebum on the skin’s surface combines with dirt and dead cells to block pores. 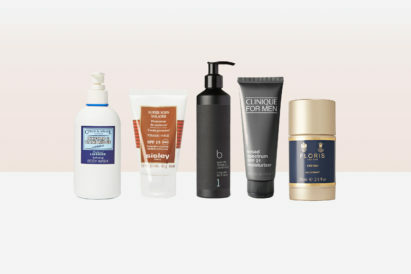 Perfect for skins prone to blemishes are ultra-light, oil-free moisturisers like Murad’s Skin Perfecting Lotion and Neutrogena’s Visibly Clear Oil-Free Moisturiser which are designed not to clog pores and contain ingredients like Retinol and salicylic acid to speed up cell turnover and help zap zits. Men’s skin is thicker than women’s (yep, we really are thick skinned) and has a greater density of collagen – the structural protein that gives skin its strength and firmness. 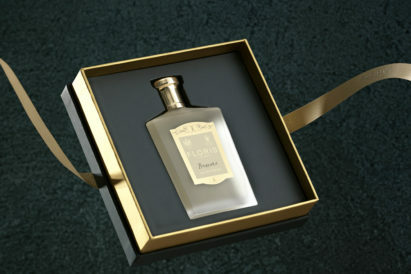 Testosterone, meanwhile, helps stimulate oil production keeping skin supple. Once a man hits his forties, though, oil production slows and collagen begins to thin leading to a noticeable escalation of the ageing process. 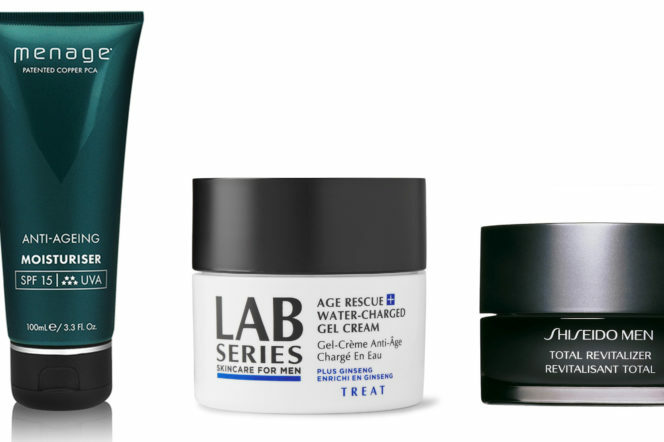 For this reason, it’s worth opting for a moisturiser like Lab Series Age Rescue Water-Charged Gel Cream which is designed to actively support collagen production while keeping skin plump and hydrated. 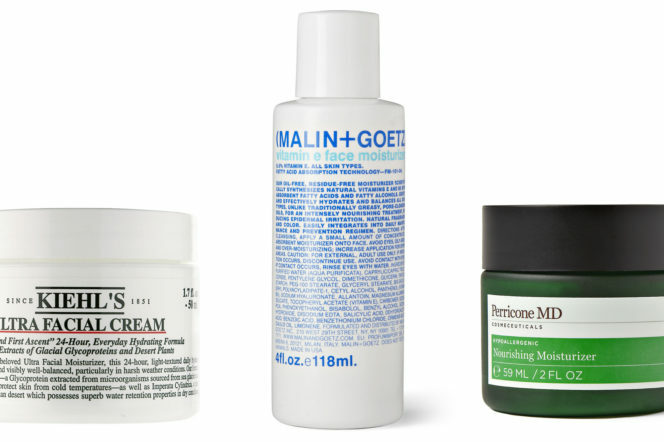 If you’re a gentleman of a certain age it’s a moisturising must-have. 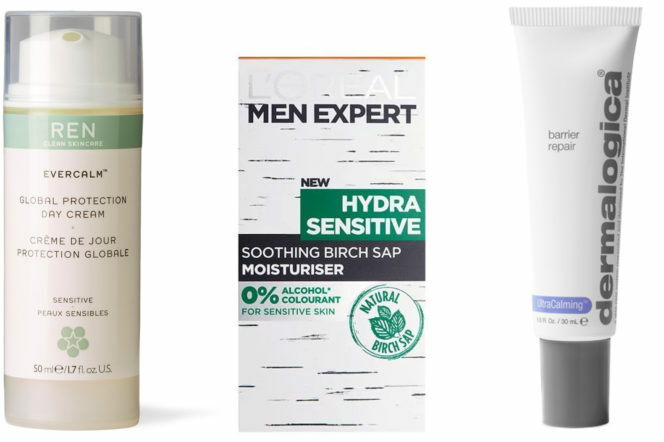 Men with sensitive or easily irritated skin are often wary of using skincare products for fear they’ll exacerbate their condition but a moisturiser is essential to prevent skin from becoming dehydrated – and even more sensitive. 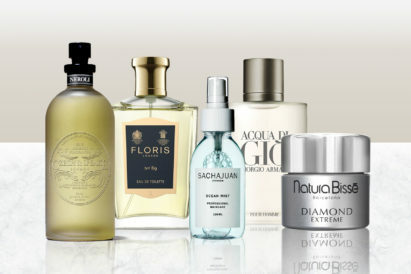 Key to choosing the right product if you’ve easily irritated skin is opting for something that’s free of potential sensitizers like artificial fragrance, colourants and mineral oil. Since skin often becomes sensitised because it’s natural barrier is compromised it’s worth using a moisturiser like Dermalogica’s Barrier Repair which is designed to help shield skin from irritants and which also helps soothe redness and inflammation. We all know about the importance of protecting our skin from the sun’s burning UVB rays but its UVA rays, which cause skin ageing, are just as dangerous and they bombard the skin all year round, even in winter. To minimise the risks of fine lines, wrinkles and unsightly age spots a daily moisturiser with a built-in sunscreen is essential. 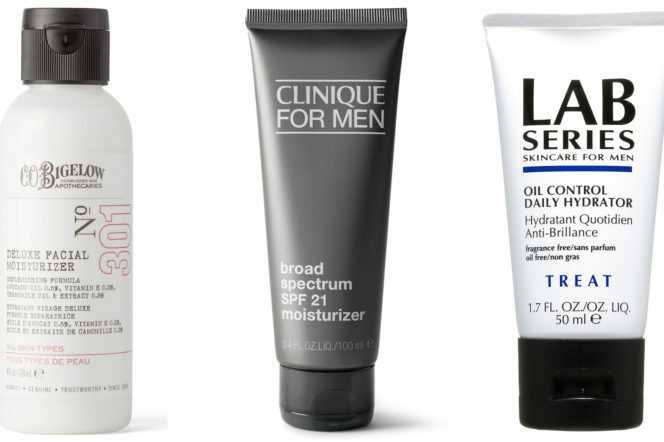 Make sure you opt for one like Clinique For Men’s Broad Spectrum SPF21 Moisturiser which offers ‘broad spectrum’ protection against both UVA and UVB rays though. You only need to apply in the morning, obviously – nobody ever got moonburn – and the sooner you start using the better: prevention is always better than cure when it comes to skincare.